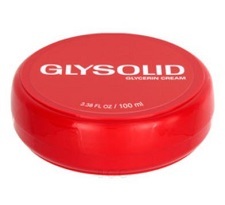 Glysolid provides intensive care for dry and normal skin. It is formulated with Glycerin and Allantoin to protect, moisturize, soften and regenerate your skin, whether it is dry, damaged, sensitive or stressed. Powerful protection for your daily skin problems. No fragrance, colors or preservatives. Glysolid is a generations-old German company that makes advanced European formula creams that have helped smooth, soften, heal and moisturize dry or rough skin on the hands, feet and body for more than 70 years. Now part of the larger Burnus Group, their products are still manufactured in southern Germany near the ridge of the Alps, and continue to be among the favorite skin care products in all of Europe. Glysolid cream is especially effective on the toughest areas of your body - the hands, elbows, feet, heels and knees - where lighter creams and lotions are almost completely ineffective.